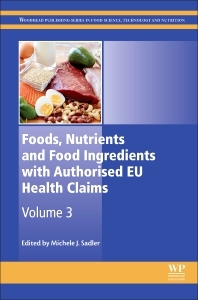 Foods, Nutrients and Food Ingredients with Authorized EU Health Claims, Volume Three, provides an overview of how health claims are regulated in the European Union, along with detailed scientific and regulatory information about permitted health claims for foods and ingredients. The latest volume in this series focuses on regulatory coverage from EC 1924/2006, including the most recently authorized claims. Topics discussed include sections on the Authorized reduction of disease risk claims, including calcium, calcium with Vitamin D, Vitamin D, Folic Acid, Limicol® and MUFA and PUFA., health claims based on emerging science, recent regulatory announcements, and finally, general function claims. The book represents the go-to resource for R&D managers and technical managers in the food and beverage and dietary supplements industry, product development managers, health professionals and academic researchers in the field. Michèle Sadler has been working as an independent nutrition consultant, with experience as a nutritionist at BNF and IGD. Her company, Rank Nutrition Ltd, focusses on the application of nutrition science within the food industry, including nutritional strategy, new product development and product positioning particularly in the area of health claims, advice on product composition, compiling dossiers for health claim applications, and advising on protocols for clinical trials to support health claim applications.